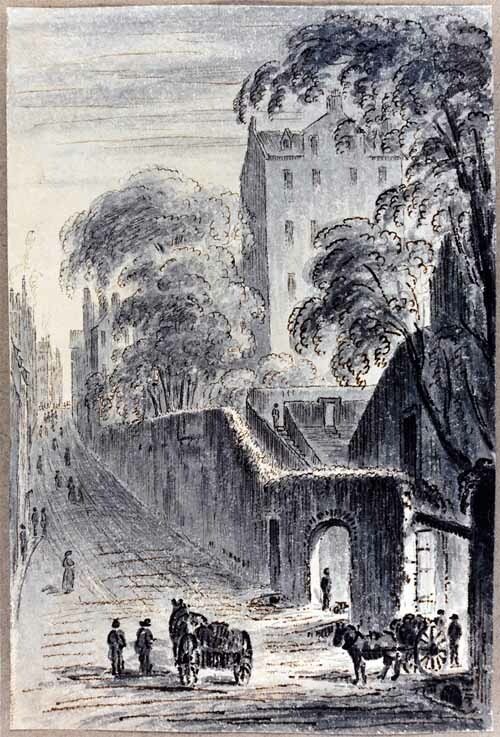 James Skene’s 1817 view of Leith Wynd (illustration 1.) was painted from what must, now, be the front door of East Market Street’s new Council Headquarters. It shows the Wynd lined, to the left, by tall buildings and to the right by the Flodden Wall, which runs down from the Netherbow. Behind the wall is a singular, 5-storey tenement. All this was demolished in the 19th century, to form Jeffrey Street. When the Victorians formed Cockburn and Victoria Streets they very beautifully re-connected them into the surviving mediaeval fabric; but here they left the job incomplete, for Jeffrey Street blocks not only the important Leith Wynd but all the closes that used to run north from the Old Town, and replaced the vigorous outline shown in the Skene print with a uniform wall of building. Our sketch model (2.) 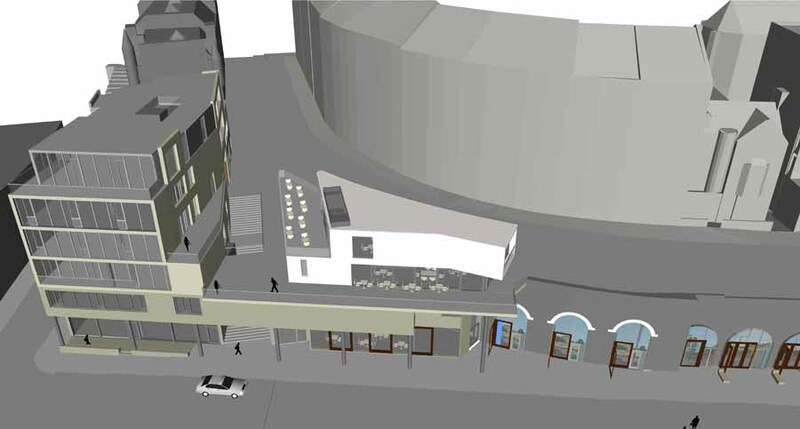 shows the situation today and our proposals for Leith Wynd to be rebuilt, to connect the High Street down onto East Market Street. 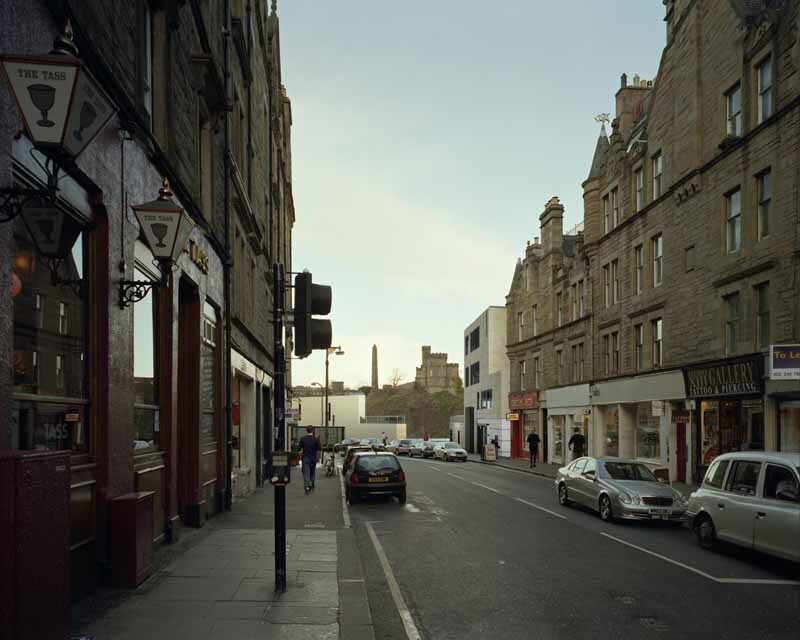 The recovered Wynd is lined again by tall buildings on its left, with shops and entrances to offices off the steps. 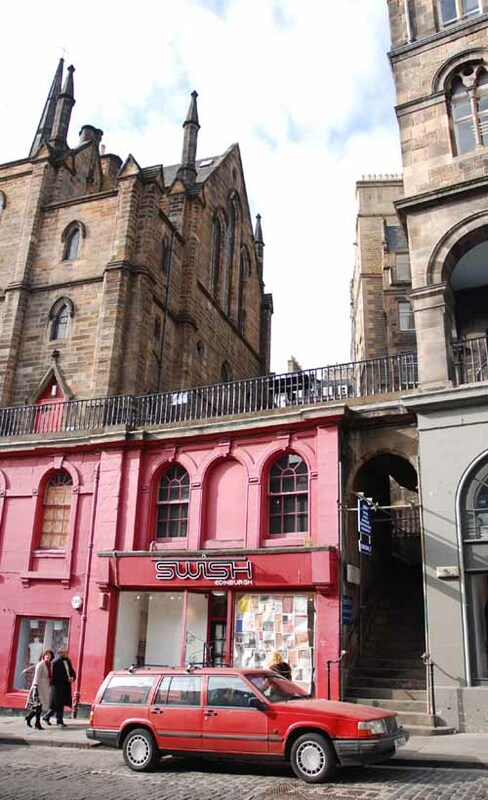 To the right of the steps is a bar, built into the vaults under Jeffrey Street, with a 2-storey restaurant on top of it, entered at Jeffrey Street level. The whole proposal completes the Victorians’ work by recovering the vigour, connectivity and varied-outline that Skene’s print shows. 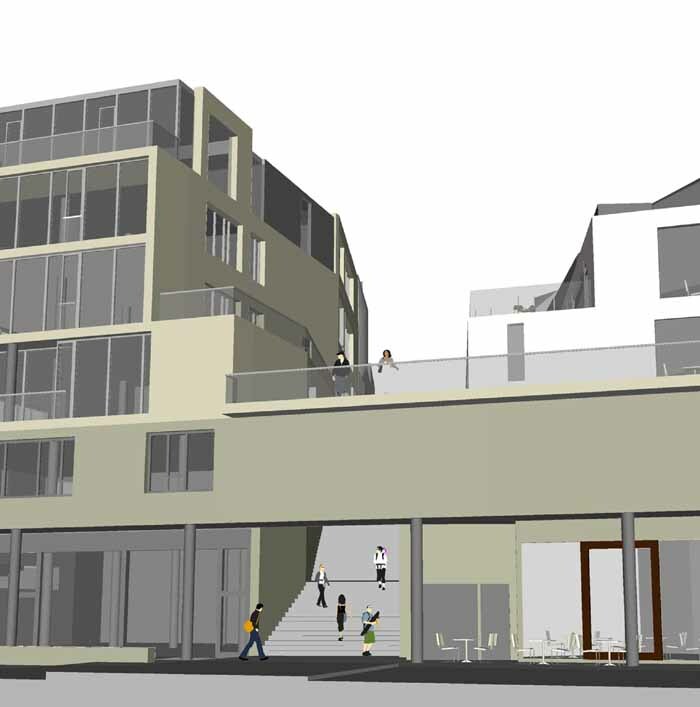 But it also offers something new, with a large (150 square metre) new public square at Jeffrey Street level, projecting over East Market Street. This square offers the public magnificent views up and down the Waverley Valley and across to Calton Hill. It is nice to see how completing the Victorians’ work here mirrors what they did elsewhere in the Old Town: illustrations 3. and 4. show the similarity between how the ancient Upper Bow meets a Victoria Street that has Victoria Terrace sailing overhead, with how our Leith Wynd meets East Market Street, with the new viewing square overhead; while 5. and[ 6. not included, image file unknown] shows how the occupation of the vaults under Jeffrey Street by artists’ studios and retail outlets mirrors the situation at Victoria Street, with Victoria Terrace on the roof of its shops. 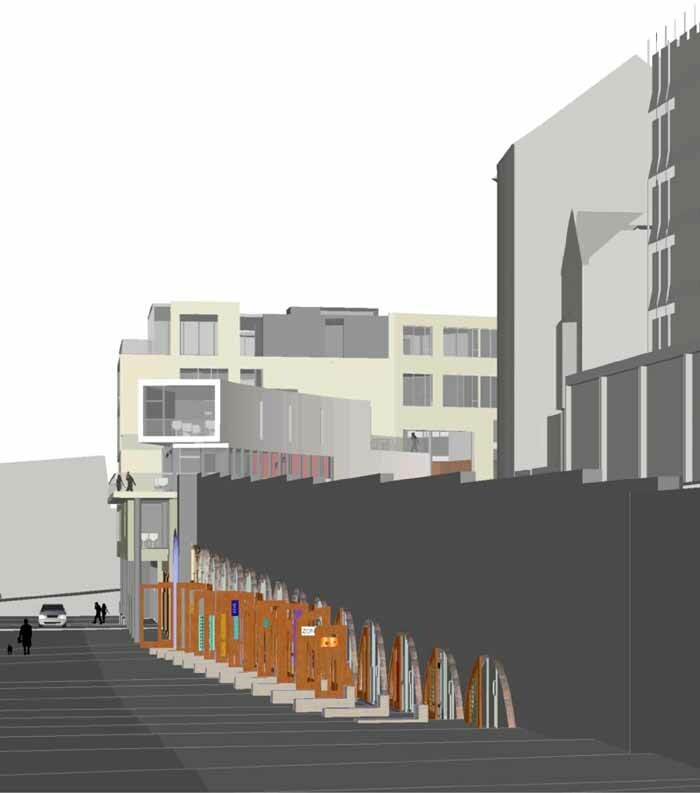 What our proposal does with the view from the top of the Canongate, looking north down Jeffrey Street (7.) is equally important. The existing vista was opened-up by the Victorian demolition. 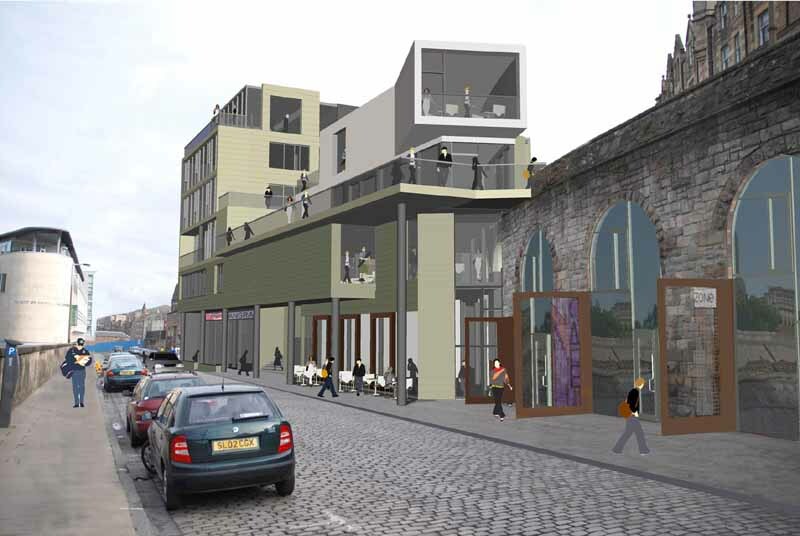 The new Leith Wynd means that the view offered is not now blocked by the parapet and drop. But in reintroducing the vigour of the mediaeval layout we were aware of how much people enjoyed this view, and were determined to retain and enhance it. The buildings are set-out with great care, to frame and reveal the important parts of the view. The whole, again, recovers the historic texture of the Old Town, with its alternating rhythm of buildings, routes and views. It has been a surprise that people have wanted to keep the sites created by Victorian demolition empty of buildings. 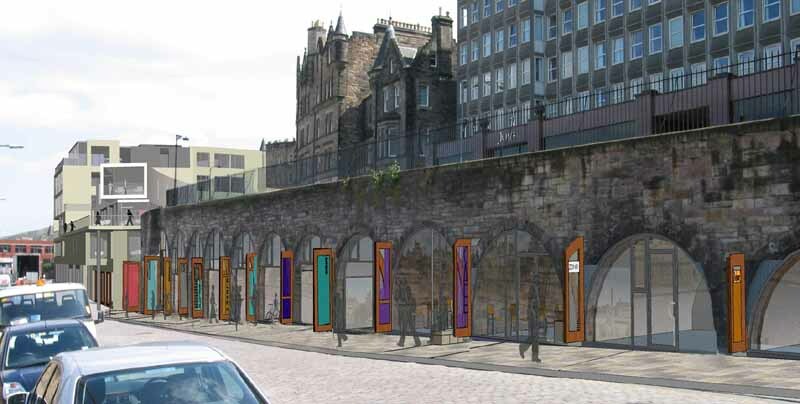 We welcome the chance, through the Evening News, to show the people of Edinburgh how our proposals respect and enhance the vigour of the Old Town by re-establishing historic routes, providing inspirational new public places, and treasuring much-loved views.